determined the manners very in detail about, actual training. The manners are conveyed even now in Eiheiji and the priest-trainee is defending it severely. For instance, I introduce the manners of bathing and the go to toilet. In eiheiji, conversation is prohibited in the bathroom or toilet. the rule exists to prevent the useless conversation of a priest-trainee. According to the teaching of Dogen, even the go to toilet or the bathing is important training. There is the rule that they should do on the occasion of bathing and the go to toilet. The person who enters into the toilet must worship to the Buddha of the toilet,called Ususama. And he excrete as the manners after he voiced the short word of the essence of sutra. The toilet and bathroom and exercise hall where does Zazen are said to be the place where should keep three silence. Also, other various manners are determined in Eiheiji. and the case when a priest-trainee passes with the others in the corridor, and the case that he enters into bedding at night. When they entered a private school everyone is not possible well. Therefore the priest-trainee goes through hardships. However, they notice that there is no unnecessary part in these manners, and they are the most beautiful action. He transcends the captivity called the manners by training. In the The writing of Dogen Zenji, there is the textbook that absent in other sects. It is “Tenzo-kyokun” that explained the manners and spirit of the cooking charge of a temple. The representative of a cooking charge is called Tenzo in a Zen temple. fire prevention charge or memorial service charge, guidance charge etc. It looks like the personnel change of a company. The charge that makes a meal is called Tenz-dormitory. method of seasoning, feeling of the gratitude to food,and so on. Also, it is determined with the textbook called “Husyuku-hanpo”, about the manners when you eat. Contents of the Tenzo-kyoukun are not a mere cooking method. It contains actual preparation and mental attention point of cooking. For instance, when you wash rice you must confirm that there is no hole of a tub well. You should do it with the water of the minimum. See well whether or not a foreign substance is not mixing while washing. You must not discard water after you washed rice. Use it to wash a plate. Even other case are decided in detail. Zen-Cooking is not the cooking of mere home cooking or restaurant. 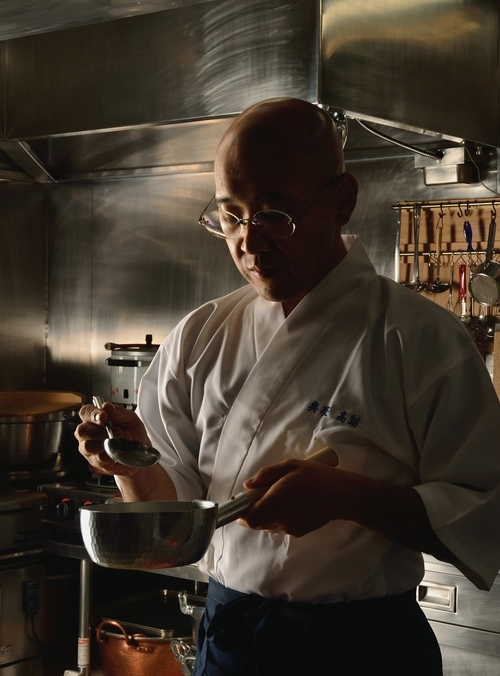 There is an original mind in Zen-Cooking. It is the mind that does not dislike the device and trouble. You treat it to Buddha and priest by the mind. You will get the valuable because you cook it with the mind. Even that cooks is important training.